I came to the realization a few years ago that the eBook reader Marvin was hands down, the best ePub reader for me. Very flexible, configurable and some (still) unique features made it well worth the price. That was, as I mentioned, a few years ago and I started to get a little frustrated with a few important (to me) missing features, such as ePub 3 features like aside (pop-up footnote) support, syncing and a few other small things. The lack of these was one thing that bothered me. The fact that the same developer released a second, free ePub reader app that offered these features was even worse, and quite frustrating to those that paid for the original app. It wasn’t simply an easy task to switch from Marvin to Gerty though. 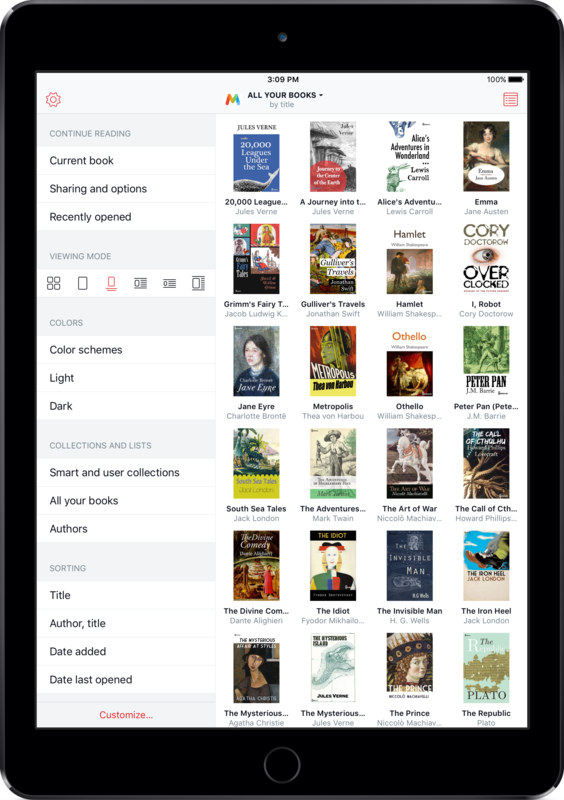 It wasn’t designed as a generic ePub reader, but rather a sort of book-journaling app. What was the developer thinking? It turns out he was thinking. And working hard. He was rewriting Marvin from scratch. Today, he released Marvin 3. This release adds, and far surpasses my original wish list. Now there is full iOS9 support, including document picker, spotlight integration and split-screen support. The icing on the latter part of that particular cake is that there is a second, nearly identical app, called Marvin SxS (“Side by Side”) that lets you have two copies of Marvin installed on the same device and you can have two ePubs open at the same time in devices that support split screen. There are lots of great built-in fonts, whether you are a sans or a serif fan. There is also OpenDyslexic built in. If you aren’t satisfied with any of the bundled (and system) fonts, you can sideload others. There is native comic book (CBR and CBZ) support, and it’s really, really good. I have, and love, Chunky Comic Reader, but in practice, there are only a few significant advantages Marvin 3 lacks – PDF comics, landscape for dual-pages and ComicStreamer support. The page thumbnails (with long-tap to preview the page) are wonderful. The zig-zag mode is much like Chunky’s “pan” mode. You can scrub through the comic and have page previews show you where you are. Given that Chunky is iPad only, I might find myself using Marvin for some of my comic reading, depending on the amount of dual-pages I might expect. I have only touched the surface. The only other reader that comes close regarding configurability is Moon+ Reader Pro on Android. It is not a free upgrade. There are two in-app-purchases to unlock full screen use and color themes, $3.99 USD for the former and a variety of “tips” for the latter, although you only get certain themes depending on the amount you “tip”. Kinda sounds to me like a purchase and not a tip… The SxS version is a full purchase without IAP unlocks – other than the themes. To me, the regular IAP (or outright purchase) is well worth the cost. The colours, not so much, but that is merely an opinion. 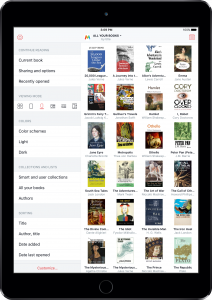 The bottom line is, if you’re looking for the best ePub reader, get Marvin 3. I, like many other racing fans, eagerly awaited Firemint’s latest offering in the mobile offering, RealRacing 3. I bought both previous games in the series (even got RR2 for two different devices). I was excited when I saw the videos, and excited to know it would be free! So when it was released, I kept checking my iTunes Store to grab it as soon as I could. I got it! Then I read the backlash. I checked the IAP prices… Yowza, that’s ridiculous. Should I just forgo the game and play the still-great RealRacing 2? Well, let me try it a bit. Man, it looks good. The controls are as good as I’d expect. The physics is fun, and the grip model is not “all or nothing” like RR1. It’s good. The issues come when you have to repair your car and they put their hand out – either to get you to pay actual cash or wait a few minutes for basic repairs, for example, oil changes are necessary and take about 3 minutes. Tires take a little longer, and so on. Really, it’s not that bad. I just queued up oil, brakes, and tires (about 10 minutes) and took a little break. I wrote a blog post. I’m not sure how the game will progress, of course. Will it be ‘pay to win’? But there’s one thing I’m very certain of right now. I will not pay a thin dime in IAP. I’m insufferably cheap with these things. I would have dropped a few bucks for this game, so I guess I have my profligate moments. But if I can merely grind to get farther in the game, I will. So far, this looks like a reachable and reasonably fun goal.